Eight Republican congressmen have asked the Justice Department inspector general to tell them the names of FBI employees who demonstrated anti-Trump bias while investigating Donald Trump and Hillary Clinton. It’s been known that two high-ranking FBI officials, Peter Strzok and Lisa Page, had a strong bias against Trump and in favor of Clinton while investigating Clinton’s mishandling of classified information and Trump’s alleged “collusion” with Russia to sway the election. “I find anyone who enjoys [this job] an absolute [expletive] idiot. If you dont [sic] think so, ask them one more question. Who are you voting for? I guarantee you it will be Donald [Trump],” Agent 1 told Agent 5 on Aug. 29, 2016, using an internal FBI messaging app. “That’s so sad and pathetic if they want to vote for him,” Agent 5 replied. To which Agent 1 replied, “You should know; … that I’m … with her,” repeating Clinton’s campaign slogan. Both agents defended themselves to the IG, saying they thought these messages were not retained by the bureau. They said their political views didn’t affect how they performed their jobs. The day after the election, FBI Attorney 2 had a dramatic exchange with another staffer identified as “FBI Employee” (who was not involved in the Clinton investigation). “I am numb,” FBI Attorney 2 wrote. “I can’t stop crying,” FBI Employee replied. “That makes me even more sad,” FBI Attorney 2 said. FBI Attorney 2 then said he was “stressed” and “devastated” that the FBI’s reopening of the Clinton investigation less than two weeks before the election may have influenced the outcome. FBI Employee appeared to try to console FBI Attorney 2, saying Clinton voters “would not, and were not” swayed by the FBI decision. “Trump’s supporters are all poor to middle class, uneducated, lazy [expletive] that think he will magically grant them jobs for doing nothing. They probably didn’t watch the debates, aren’t fully educated on his policies, and are stupidly wrapped up in his unmerited enthusiasm,” the FBI Employee said. FBI Attorney 2 lamented that the policies of President Barack Obama would be undone under Trump and that he still felt like the FBI may have played a role. “Plus, my [expletive] name is all over the legal documents investigating his staff,” he said. In another exchange on Nov. 22, 2016, FBI Attorney 2 messaged “FBI Attorney 1” (who had prominent role in the Clinton investigation) a comment on how much a Trump campaign staffer was paid. Their letter specifically mentioned FBI Attorney 2. They also inquired about unnamed FBI employees that, according to the IG, accepted gifts from news reporters, including sports tickets and invitations to golf outings, dinners, and nonpublic social events. “We will separately report on those investigations as they are concluded,” the IG stated. 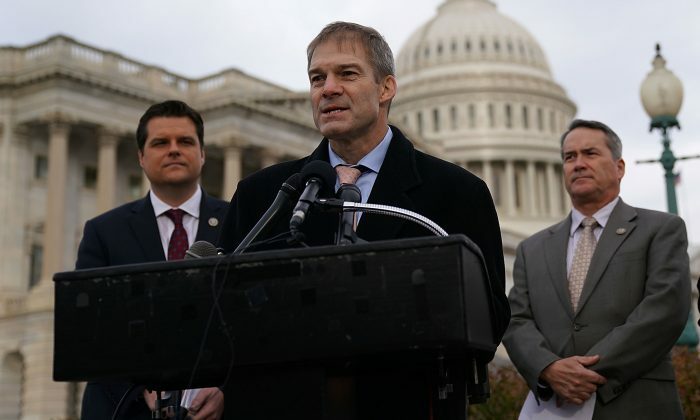 The letter was signed by representatives Andy Biggs (R-Ariz.), Dave Brat (R-Va.), Scott DesJarlais (R-Tenn.), Matt Gaetz (R-Fla.), Paul Gosar (R-Ariz.), Jody Hice (R-Ga.), Jim Jordan (R-Ohio), and Ralph Norman (R-S.C.). While Strzok has been kicked off the team of special counsel Robert Mueller, who took over the Trump–Russia investigation, and Page quit the FBI in May, there’s no indication any of the unnamed FBI employees mentioned in the IG report left their posts. Texts between Strzok and Page went beyond bias and implied “a willingness to take official action to impact a presidential candidate’s electoral prospects,” the IG stated. The IG is working on another investigation on the Trump–Russia probe. Republican lawmakers have been suggesting the investigation was launched for political reasons. The investigation has turned up evidence that Russia tried to influence the election, but no evidence that this effort was coordinated with the Trump campaign. It included an extensive spying operation against the Trump campaign, but it’s not clear what prompted it, as the supposed rationale leaked to The New York Times has been challenged by a growing list of evidence. Update: The article was updated to specify the role of the FBI employee with whom “FBI Attorney 2” exchanged messages on Nov. 22, 2016.